Mr. Chancellor, Peter Trudgill is one of the world’s foremost sociolinguists and authorities on dialects. He studied modern languages at King’s College, Cambridge and earned a PhD in linguistics from the University of Edinburgh. 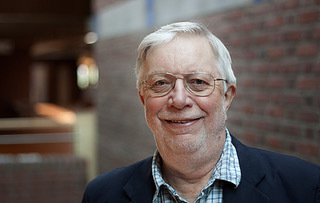 He subsequently held teaching and research positions at universities worldwide, including the University of Reading, the University of Lausanne, Switzerland, and at the University of Fribourg, from which he retired in 2005, and where he is now Professor Emeritus of English Linguistics. He is also an Honorary Professor of Sociolinguistics at the University of East Anglia. Among his peers he is famously renowned as one of the first to apply and refine William Labov’s sociolinguistic methodologies in the United Kingdom, and to provide a framework for studying dialect contact phenomena. He is known in the field today for his theory on the development of post-colonial varieties of English. Working with multiple languages, he has carried out linguistic fieldwork in Britain, Greece and Norway, and has lectured in most European countries, Canada, the United States, Colombia, Australia, New Zealand, as well as numerous Asian nations including India and Thailand. He has received honorary doctorates from Uppsala University Sweden, the University of East Anglia, and La Trobe University Australia. He is a Fellow of the Royal Norwegian Society of Sciences and Letters, Fellow of the Royal Gustavus Adolphus Academy for Swedish Folk Culture, a Fellow of the Academia Europaea, and a Fellow of the British Academy. Mr. Chancellor, in recognition of a lifetime of distinguished and ground-breaking scholarly work, I ask you to confer the degree Doctor of Letters, honoris causa, upon Peter John Trudgill.